Today I am going to introduce you with one more power blogger Jane Kryukova (marketer in Texterra). Interviews are the great way to know person, her struggle, life journey and achievements. It make all of us strong and also give inspiration to create our own world of happiness. This is the 25nd edition of powerful, successful and inspirational interviews in the series of Journey of a Professional Blogger, interviews on EASKME.com. Today we are going to publish interview with a professional Blogger, Jane Kryukova (marketer in Texterra). After graduating from the institute I got a job in my company as a marketer, and one of my responsibilities was filling its Internet marketing blog. At that moment it contained very few posts and all of them were lack of expertise. Today it has more than 1000 posts and is considered one of the most popular Internet marketing blogs in Russia. During these three years I learnt how to create great content and successfully used my skills in writing. To prove my words, here is the traffic of our blog - https://take.ms/7jzWn (sorry, can't reveal the numbers, but believe me - they are quite impressive). What is interesting, before I came in my compeny I didn't have any experience neither in writing, nor in internet marketing. But as you can see, it didn't prevent me from achieving great results. The main rule here - to be highly interested in what you write about and try to create that type of content that people would like to share. You may not have a beautiful style of writing, or super talent in storytelling. You even may have spelling and grammatical mistakes in your articles, but if they are helpful and have a lot of useful information, they will succeed. Ans: In 2012 content marketing wasn't very popular in Russia. I will say more - very few brands actually used it on their websites. Our company was the first one that started to use the principles of content marketing in its blog. Our post "What is content marketing" has been holding the search engines top-3 for already 3 years, being higher than wikipedia - https://take.ms/X1Fpx. The right people were found on freelance sites, through various sites for job seekers and so on. But the understanding that they are right didn't came immediately. It took a long time to teach them and make of them excellent specialists. The biggest obstacle that we faced was understanding the needs of our audience and learning to create that type of content that it will love. To struggle this obstacle we tried many different types of content, analyzed tons of statistics and spoke a lot with our potential clients. Today all our blog posts have success. It may sound a little pompous but it's the truth. We publish new posts rarely but all of them have very high quality and usually get a lot of likes, shares and comments. Ans: Definitely. I don't have any examples from my practice. But some clients that offer our services told us that our blog helped them a lot. I don't know if it saved their life or not, but the I think it definitely could. The words have great power and do may influence the life of people around you. Funny fact: since our blog is dedicated to white hat Internet marketing, there were several people that swear that always were black hat seos and became white hat only because of our articles. And I'm absolutely sure that there are a lot more such people that have the same story but preferred keep silent. Mailchimp (no words needed) and MailChimp alternatives. IFTTT (makes my life easier). In my work I use the 2-minute rule - if you can do a task in 2 minutes, than do it immediately. It help me being very productive. But this rule doesn't work all the time. Sometimes when I need to write an article and I need to analyze a ton of information, I have to put off all the other tasks and ask my colleagues not to bother me. The main problem that I face at that moment is the high volume of noise in the office, but I learn how to struggle it. Let me show you the picture - https://take.ms/oFbg4. These are the headphones that are used on construction projects :) And they are able to protect your ears from even the heaviest noises. Recommend this thing to all the bloggers that work in offices. Ans: Blogging is the modern way to find new customers :) I'm not speaking about those who use blogs to earn with the help of advertising. I'm speaking about those who show their expertise by the meaning of their blog, help readers to solve their problems, earn their respect and eventually have them as paying customers. Many people today (especially, here in Russia) don't understand this thing. They can't understand how educational articles can possibly bring the clients. But our practice proves it daily. We monitor the sources of all our sales leads and a huge part of them come from our blog. These guys know exactly how to create great content. I read them daily and learn many useful things from their articles. This is how bloggers should work and that's how I always try working on our own blog. Social media promotion and SEO are the two must-dos for all bloggers. In my company I'm responsible for social media promotion and my colleague is responsible for SEO. Social media promotion takes me about half an hour daily and SEO - approximately the same amount of time. Ans: I don't write articles every day. We have one or two posts in our blog weekly and some of them are written by my colleagues. Usually a big and very detailed article take me a week to finish it. At this period I write every day and spend about 5 hours a day on blogging. Ans: Create great content, be yourself and use construction headphones :) Blogging is the cool thing which helps to enjoy your time, earn money and communicate with awesome people. Do blogging and be happy - that's my main advice which I want to address you, dear readers. Thanks for your attention and goodbye. 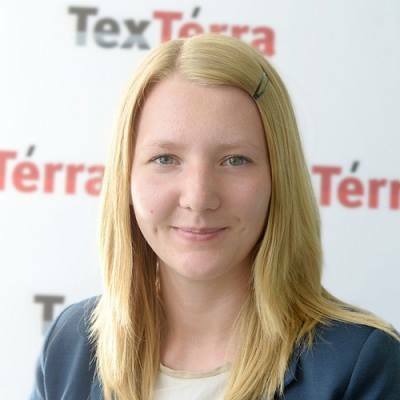 Don`t forget to share about Jane Kryukova (marketer in Texterra) on your social profiles. If you want me to Publish your interview, feel free to contact me.